The 2018 elections are here, and you can take 3 actions to get Democrats elected up and down the ballot–Vote, Knock, Donate. If you have any questions, just email us at info@nebraskademocrats.org. Check out the over 600 Democrats running statewide in 2018–this is a record and one more indication we have a blue wave coming…but only IF we vote #NebDems #BlueWave2018. 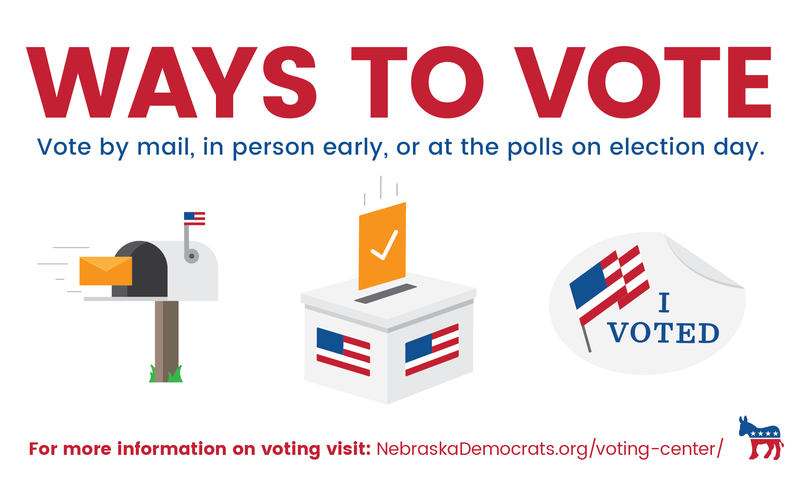 You can vote 3 ways for the Primary Elections–choose the one that works best for you. You must be registered to vote first, so take that action now. Vote in person on Primary Election Day, May 15th from 8am-8pm CT at your local polling location. Vote early, in-person, at your County Election Office from April 16-May 14, 2018. Vote by mail starting on April 9. Person to person communication is always the best way to get people to vote. You can serve as a Block Captain where you get assigned 50 houses in your community that you are responsible for getting to the polls. Join the over 250 Block Captains across the state. This is how we win elections. You can also volunteer for one of the over 600 Democrats running for office across the state. Check out the list and go to the candidates’ websites to volunteer. Donations from grassroots Democrats are critical to winning elections. Sign up to be a monthly donor, this helps us fund all of the voter outreach statewide for all Democrats. Donate $18 in 2018 to elect Democrats. Giving to the State Party benefits all Democrats with our coordinated Get Out The Vote, Block Captain, Vote By Mail and Voter Registration programs.